Elhadj Mohamed Diallo wants to make sure that others won’t experience what he has lived through. 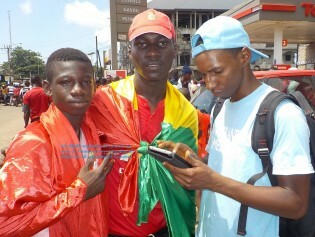 The former irregular migrant who has returned home to Guinea from a jail in North Africa is calling on his fellow returnee migrants to establish associations in their respective countries, which will serve as powerful platforms to combat irregular migration across the continent. Elhadj Mohamed Diallo was a prisoner in Libya between October and November 2017, but he was not helpless. Far from his home in Guinea he understood the power of an organised union. Thousands of migrants mainly from Sub-Saharan Africa have died or ended up in slavery as they attempt to travel to Europe irregularly through the desert and across the sea. Many were recruited by traffickers who deceived them into believing that the passage to Europe would be safe and easy. The International Organization for Migration has taken its campaign against irregular migration to the airwaves in Nigeria. Working in conjunction with some Nigerian radio stations, the United Nations Migration Agency has launched a radio series on safe migration. Hundreds of desperate young Nigerians die yearly in the Sahara Desert or at sea while making irregular journeys to Europe. The desperation to reach Europe at all cost, irrespective of the risks, is a major social problem in Africa’s most populous country. This year the Internal Displacement Monitoring Centre (IDMC) noted that 2017 saw the highest number of displacements associated with conflict in a decade-11.8 million people. But this is not a situation that is going to be resolved any time soon, says the organisation which has been reporting on displacements since 1998. The Migrants as Messengers awareness-raising campaign (MaM), developed by the International Organization for Migration (IOM), uses innovative mobile technology to empower migrants to share their experiences and to provide a platform for others to do the same.